During the late 1960’s the Shell Oil refinery at Stanlow, Ellesmere Port, Cheshire was finding it increasingly difficult to maintain sufficient crude oil supplies. The problems were due to the restrictions placed on oil takers by the fast tides and busy nature of the Mersey Estuary. At the time, to reduce cost, the world was changing to larger oil tankers which could not be accommodated at the Stanlow offloading points. The solution to this problem was to build a floating oil receiving station just off Amlwch in 1972. 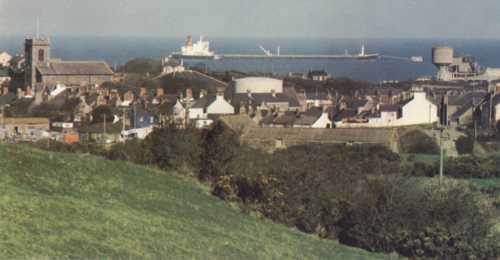 Oil from the station was pumped to a shore station at Amlwch port. From here it was pumped to a holding station at Rhosgoch and then onwards via underground pipes to the oil refinery at Stanlow. 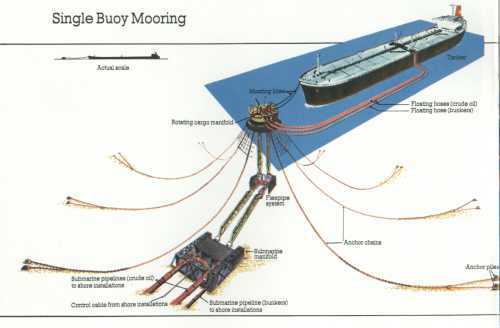 The single buoy mooring (SBM) enables a tanker to swing around a single point with the tide. The one at Amlwch was 21 metres in diameter and weighed 500 tonnes. Oil from the tanker was pumped off via a 40-inch diameter pipe to the Amlwch shore station. At the shore station booster pumps were used to transfer the oil to the inland station at Rhosgoch. 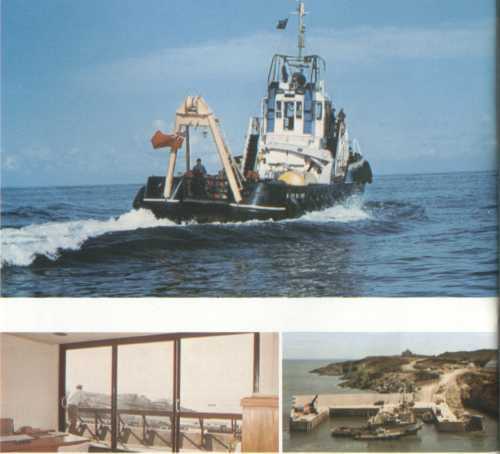 To service the buoy two small vessels, the Afon Alaw and Afon Briant were situated in new storage terminals which were built on the site of the old ship yard in Amlwch Port. These pens were available at all states of the tide and allowed the tugs to provided 24 hours’ assistance to tankers who were mooring at the SBM. An office suite with large viewing windows was also built. From the inland station at Rhosgoch the oil was pumped via two 36-inch diameter pipes to the oil terminal at Stanlow 127 kilometres away. The pipe line had to cross some of the most beautiful country in Wales and special precautions were taken to ensure that the countryside was returned to it former condition after the pipe line had been laid. The first tanker was off loaded via the SBM in March 1974. The gigantic project was a success. However, by the mid-80s the use of large crude oil tankers was again diminishing and the terminal was closed by 1990.